I remember as soon as I bought a new Glamour or Cosmo I used to head straight to the 'Hey it's ok...' section and the back pages that used to have 'Ten Reasons Why', or something along those lines. They were always my favourite out of the whole magazine. So today I thought I'd combine my love for those pages, and my love for staying in ('cause really I'm like 80) and write this blog post. 'Cause it just seemed like the sensible option. 2) You don't have to leave your bed, which let's face it, is feeling pretty neglected right now after you abandoned it this morning. Shame on you! 3) You don't have to be around people. Especially the sweaty, roudy and rude kind. 5) You don't have to wash your hair or your body, meaning you don't have to dry it/style it, meaning you're saving yourself precious time in which you could be doing nothing. 6) You can finally catch up on all the sleep you've been missing out on. 7) OR you can finally catch up on all the Netflix you've been missing out on. 8) You know, deep down, that slippers are way more comfortable (and cute) than a pair of heels. 9) You don't get to midnight, realise you're tired, bored and have a headache 'cause the music is too loud and then have to wait five hours for a taxi to take you home to bed 'CAUSE YOU'RE ALREADY THERE. 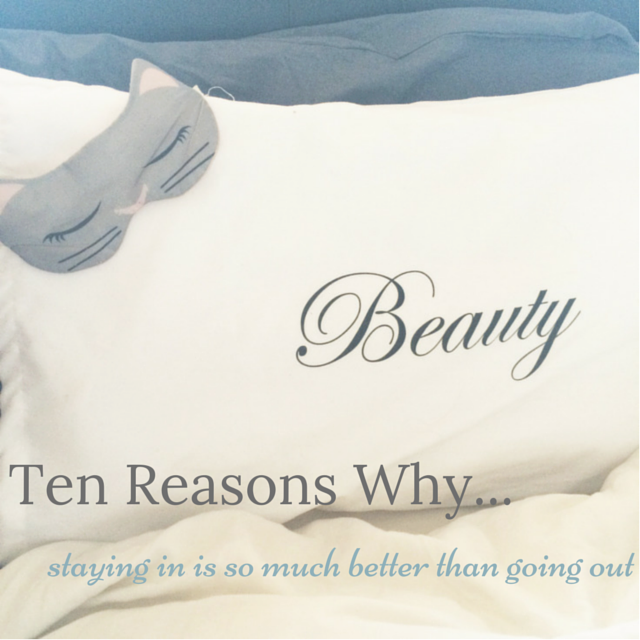 10) Did I mention, pizza, pyjamas, Netflix and your bed are all at home? Yeah, ok, good! Need I say anymore? Written from my bed, in my PJs.